What I really like about my new local market(s) is that there are not only stalls specialized in e.g. potatoes, apples or fish, but also a lot of regional organic farmers selling their excellent seasonal produce. Local organic food has several advantages. For example no manufactured fertilizers or pesticides are used for growing the plants. This requires more attention and work from the farmer, which in the end really makes a difference in taste. Since the farms are located in a 50-100km radius around Berlin, the produce is absolutely regional. The offered range of produce is both limited and rich at the same time: limited due to seasonality, and rich due to cultivating old species and a wide range of varieties. I’ve encountered the oyster plant roots at one of these organic farmer’s market stalls. This vegetable looks like a really hairy, dirty and thin root. Because it is so thin, I only removed the root hairs and carefully scraped the surface of the roots using a relatively dull knife. The scraped surface of the root tends to turn brown quickly, so it’s advised to boil or steam the roots right after peeling them. I would not recommend this root to be served raw, since it has a slightly bitter taste. Its raw taste also reminded me of liquorice. During cooking the bitter taste evaporates, so when heated the oyster plant root tastes like a mixture of black salsify and corn. 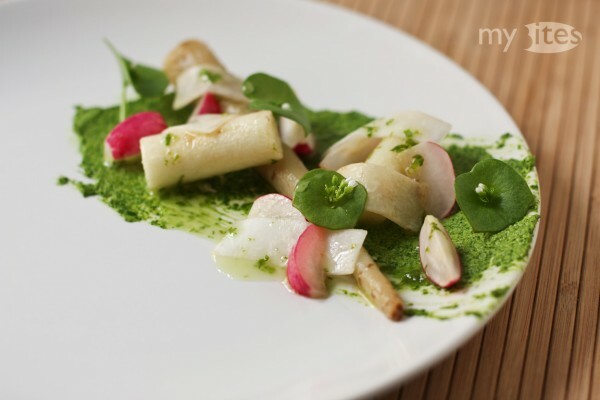 In this current dish I paired the oyster plant root with turnip, black spanish and radish. This entry was posted in Appetizer, Vegan, Vegetarian and tagged black spanish, oyster plant, oyster plant root, pesto, radish, radish leaf pesto, ramson, spring, sunflower, sunflower seed, turnip leaf pesto, vegetarian, vinaigrette on April 16, 2013 by Robert.